On the one hand, given that genes are selfish, a biology of multiply-or-die seems much more reasonable and likely to survive than our own, where proliferation is done mostly for fun. On the other hand, even Darwin realized that survival-of-the-fittest happens because life increases in exponential numbers, here on Earth. So stronger mechanisms are not really needed. The gripping hand is that fast proliferation is likely to be a common thing among interstellar life (if it exists). Ergo, even given a practically unlimited number of planets, and friendly intentions, aliens can be a great risk purely due to their biology. 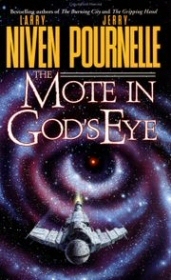 Other than that, the biology presented by Niven and Pournelle had some big holes in it -- in particular the Watchmakers. Tiny brains, supposedly un-intelligent, and can improve on technologies they've never met before? That's just too much, and doesn't fit in the otherwise hard-core book. The term for that is 'Idiot Savant'. I assume you refer to the ''watchmakers'' as idiot savants. But to be able to improve on technical concepts (at the level in which they did so in the story!) there should be, I believe, a minimal brain size... These creatures are supposedly rat-sized; the intelligent counterparts have (again, supposedly) human-sized heads, and ergo human-sized brains. Since they are ''related'', I doubt the watchmaker brains are biologically different. So, I know I'm late to the discussion but, Watchmakers are described as being(Paraphrase) one-third the height of the Engineer. That makes the Watchmakers just over a foot tall given that the Engineer was described as being just over a meter tall. Funny to stumble upon this page. For several reasons that might be. First, the way I got here was by searching a bit to read about Object Evolution, your talk at IBM this week. (I'm from Dalit's group, at Tel Aviv, and thought the subject is really interesting, I will probably miss the talk due to the fact I am here just parts of the week). The second, is that I've just met Larry Niven, last week. He spoke about this and that for several hours. This was one of the most interesting talks I have heard by I writer, on his writing. It had a lot of insight, and made you really want to jump and write a sci-fi novel as well. Anyhow, I'll take your recommendation for this one, since I haven't read it, and come back to tell you what I thought about it. Here is the original paper on Object Evolution. It's also Chapter 6 of my PhD dissertation. I hope and believe you'll enjoy The Mote. Beaver's don't ''know'' how to build dams. When they hear running water, they have have an irrestible urge to chop down a tree and throw on their dam. When they stop hearing running water, the urge goes away. The result is a beaver dam. Maybe you know how to solve differential equations, but I know you can't do it fast enough to catch a ball thrown at you. Yet you catch them. Apes can throw and catch things and they don't know anything about ballistics. Watchmakers and Engineers are like that. Somehow, I don't see evolution evolving small-brained creatures that can instinctively improve electronic devices.